Capacity 654 cc / 39.9 cub in. Length: 2060 mm / 81.0 in. Width: 711 mm / 28.0 in. Height: 1010 mm / 39.8 in. Wheelbase 1372 mm / 54.0 in. Ground Clearance 178 mm / 7.0 in. Seat Height 813 mm / 32 in. The big news from BSA came in 1962, with the arrival of new unit-construction engines, available in the 500cc BSA A50 or the bored-out 650cc BSA A65. In England these were known as Star models, whereas in the U.S. they were called Royal Star. Curious that, since we Americans had fought a bloody revolutionary war to get rid of the monarchy, and now we appeared captivated by anything that smacked of royalty. The BSA A65 Star was a Birmingham Small Arms Company (BSA) motorcycle aimed at the US market for unit construction twins. As well as giving a clean look to the engine, with the pushrod passages part of the cylinder block casting, unit construction reduced the number of places oil could leak from. A range of A65 Star twins was produced between 1962 and 1972. The decision by Lucas in the late 1950s to switch production of motorcycle electrical components (from magneto/dynamo systems to alternators/coil systems) forced British motorcycle manufacturers to completely redesign their engines. Triumph and BSA took the opportunity to move from pre-unit and semi-unit construction to full unit construction, that is, with the engine and gearbox together in an integrated casting. At the same time, Bob Fearon, managing director and general manager of BSA, recognised the need for a new look that built on the best features of the A10s but would succeed in the potentially lucrative, but competitive, US market. Working with chief development engineer Bert Perrigo, he developed the unit construction Star twins. 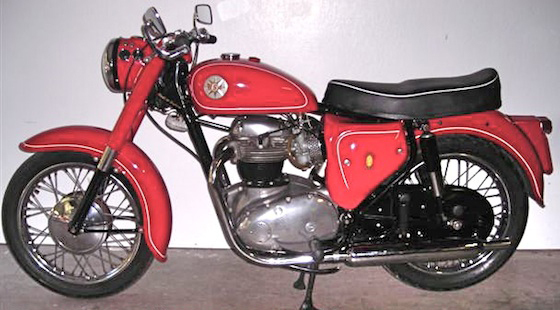 A range of these 650 cc (40 cu in) Star twins were produced between 1962 and 1972 but they were really developments of the old model range with less weight. Not enough time was spent on testing and development as BSA were struggling to remain competitive with Triumph models and the emerging Japanese motorcycles. Large side panels were fitted to cover the space behind the engine but they contributed to a dated look. This was reinforced by engine vibration, but acceleration was good to a top speed of 100 miles per hour (160 km/h). Twelve volt electrics were introduced in 1966 and the top of the range BSA Spitfire was capable of 120 mph (190 km/h). In 1967 BSA won a special Queens Award to Industry and by 1969 the BSA factory were responsible for 80% of the British motorcycles exported. In the US the 650 Star twins were selling well with styling changes including high rise handlebars and more streamlined fuel tanks. In 1970 a new 'oil in frame' design was adopted but this proved unpopular with shorter riders, as it increased the seat height. This was sorted out by 1972 but by then BSA were facing serious financial problems and stopped production of the outdated 650 Star twin. When you are riding a machine that looks as good as this you feel rather special. I am biased because I love the styling of the late Sixties BSA 650 unit twins. They have a boldness and glamour that captures the spirit of the period. 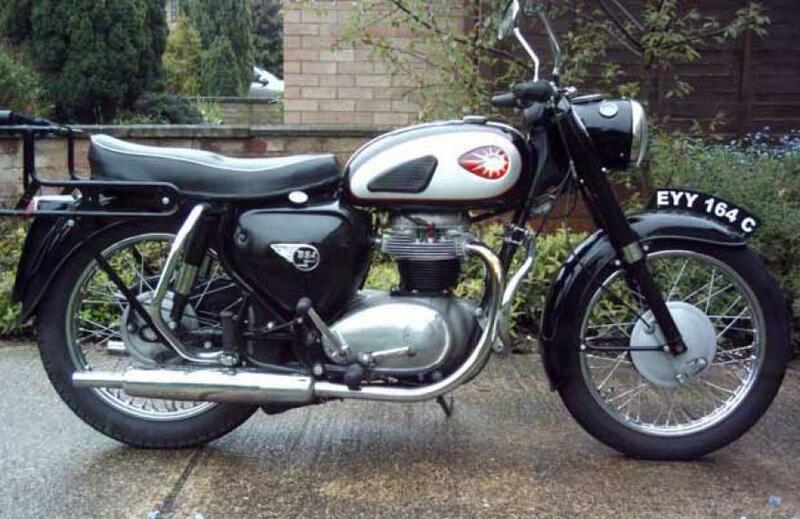 All British twins of the Sixties have that something, the BSA especially so. The machine we rode is a US spec 1968 MkIV Spitﬁre with a two gallon tank. The glass ﬁbre tank looks good, but in my opinion the UK version looks better and it holds a whole lot more fuel. Running out of petrol while riding this model came as a bit of a surprise, and reminded me that a decent fuel range tank is rather sensible. Our test example was kindly loaned by Bill Crosby of Reg Allen Motorcycles, who also runs the London Motorcycle Museum. The Beeza had stood in the museum for months and looked as though it could do with a little polishing but was basically in good fettle. Tickle the carbs and it ﬁred right away on two, sounding the part. Clutch and gearbox were ﬁne and 60mph cruising was a high, wide and handsome experience. But there was a hole in the power delivery, effectively giving two stages of performance. For fast riding it was necessary to wait for the machine to get through the hole before it took off again. So 80mph-plus speeds involved a delivery hiatus, and my guess is that to get to three ﬁgures would take some time. Some work on the carburettors would no doubt reap dividends. On this score some period road tests only just scraped 100mph for the twin carb Lightning, while the Spitﬁre, equipped with bigger carburettors and higher compression pistons, performing slightly better. But so long as they have staying power for up to 80mph cruising, that seems perfectly adequate. We have to keep things in perspective and bear in mind that the youngest of these Sixties machines is 35 years old. Besides which, on a machine with a US style handlebar speeds over 80mph are hard work anyway. The BSA delivers satisfaction in mid-range horsepower. 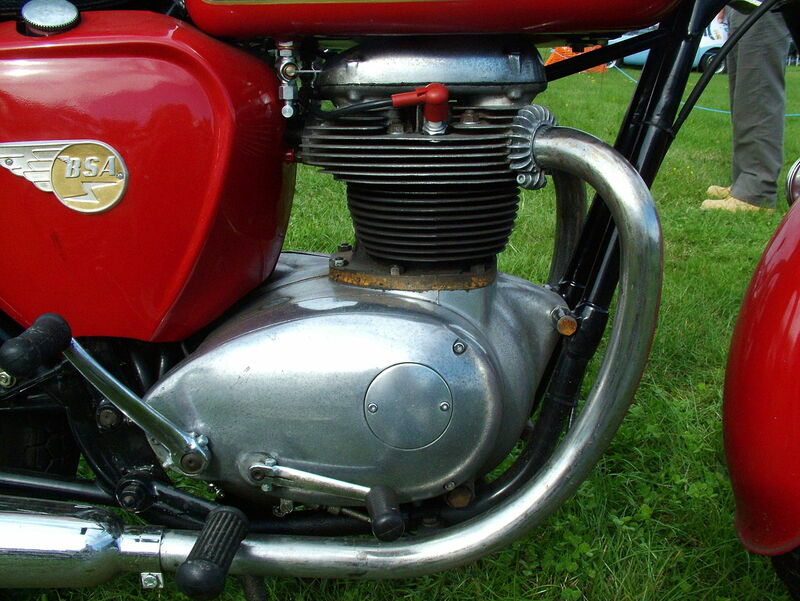 The BSA unit twin has a poor reputation when it comes to vibration. On this bike it was less than I expected. But, then again, I own a Norton Atlas. An easy machine to handle, the BSA has good steering response, and it held its line very well when hussled through the bends for our photo shoot. It’s not up to the mark of a Norton Featherbed but it’s very reassuring and has the low centre of gravity feel that is typical of a British bike. The two-way damped fork was smooth and progressive and coped well with the bumps on Cambridgeshire lanes. This 1968 Spitﬁre has the twin leading shoe front brake which is a pretty good stopper, especially for its day. This one is progressive and quite powerful. And as you would expect the rear brake can lock the wheel with ease. As an overall package this is a good machine. It doesn’t excel in any one respect, looks apart – and that’s subjective – but it is competent in every department from a rider’s point of view. 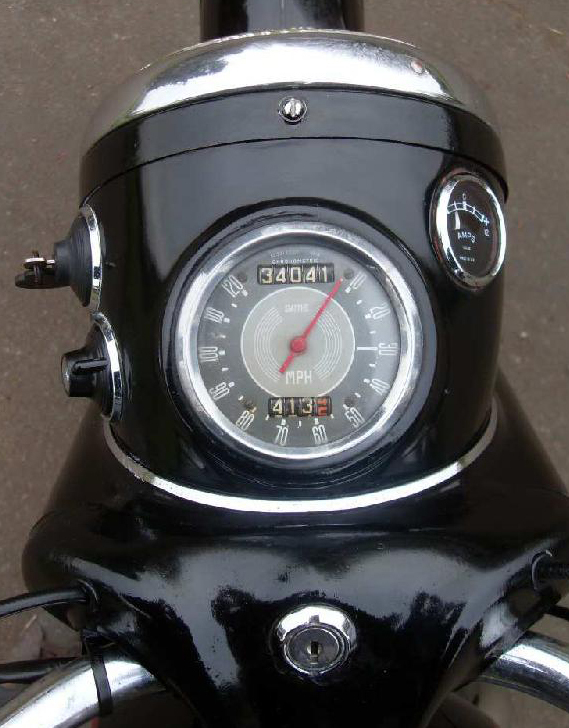 Average fuel consumption should work out at 45mpg-plus ridden atsensible speeds. If you have never ridden a BSA twin before, there’s a chance you might be slightly disappointed by the A65. But once you settle in and soak up the sight, sound and colour, the twin clocks, chrome headlight, grab rail and humped seat, you should start to fall under the Small Heath spell. The Spitﬁre, in particular, was something very special in its day and age has not dimmed its lustre.